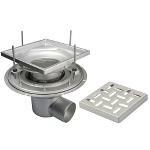 BFD-140-SO AISI Type 304 stainless steel adjustable floor drain with 12in. x 12in. (300mm x 300mm) square top, membrane clamping flange, 1/8in. (3mm) grating (standard), and no hub side outlet.